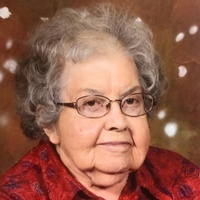 Emilie Erbele, 96, Wishek, ND formerly of Lehr, ND died late Friday evening February 8, 2019 at the Wishek Living Center in Wishek, ND. Emilie Presler was born December 7, 1922 at Fredonia, ND the daughter of John Presler, Jr. and Katie (Entzi) Presler. She received her elementary education in the local rural school and grew to womanhood in the vicinity where she helped on the family farm. In 1942 She and her sister Rose went to Gary and Hammond, Indiana to work in the steel mills to help in the War efforts. She and Elmer Erbele were married November 29, 1948 at Kulm, ND. They made their home 14 miles North of Lehr, ND and in 1996 moved into Lehr. In December of 2012 they moved into the Wishek Living Center. Following the death of her husband on December 25, 2013 she has continued to reside at the Living Center. She was a member of the Zion United Methodist Church in Lehr. She enjoyed gardening and canning. She was known for cooking special German Dishes. At the Erbele’s Sunday dinner was not complete without fresh pie. Surviving are 2 sons, Dennis (Cathy) Erbele, Lehr, ND; Garland (Pauline) Erbele, Bismarck, ND; 2 daughters, Grace (Bruce) Haugen, Hutchinson, MN; Diane Erbele, Edena, MN; 8 grandchildren;4 great grandchildren. She was preceded in death by her parents, husband, 1 sister Rose Schrenk, 2 half-sisters, Lorena Hillius and Alvina Moldenhauer, 1 half brother Ray Presler. Fumeral Service will be at 10:30 AM Wednesday February 13, 2019 in the Zion United Methodist Church in Lehr, ND with Rev. Chet Cataldo, officiating.